Today is the last day to tender your LRI shares. Make sure you do it before 3:30pm today, September 3. 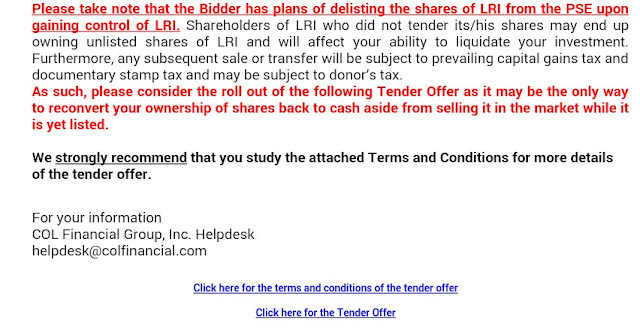 By tendering your LRI shares, your shares will be bought at 10.26 pesos each. It is suggested that you tender your shares as it is possible to delisted from Philippine Stock Market. If delisted, it will be harder to liquidate your investment. For COL Financial users, you can tender your shares by clicking the "Tender Offer.." area as seen in the image below. You will then be directed to terms and conditions page where you will see more info about the tender offer. As stated, AEV CRH HOLDINGS, Inc. plans to acquire 88.85% of LRI common shares and has plans delisting LRI from Philippine Stock Market. So better to accept the tender offer. And don't forget, it can only be tendered until today at 3:30pm. Thanks to Truly Rich Club's email notifications for reminding me. Hi. 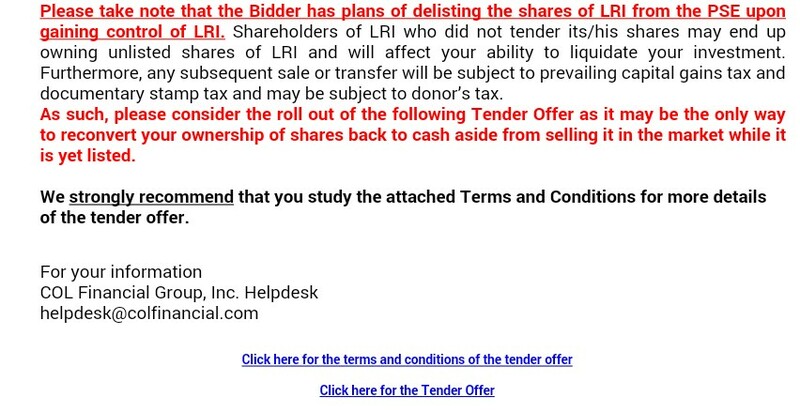 I accepted the tender offer of LRI but the only confirmation I got is the screen with a message YOUR TENDER OFFER FOR THE FOLLOWING STOCK HAS BEEN RECORDED. Is it same as yours? Is there any email coming from your stock broker re the sold stock? As of now, I checked my portfolio and there's no LRI anymore.